Deaf dog: Kelsey, a three year old deaf Dalmatian, has travelled the world, living in the US, Azerbaijan, and now Macedonia. Not surprisingly, she's a very adaptable pooch. Deaf dog: Jasper is a two year old Dalmatian who was born deaf. Other pets: Pebbles and Beemer, two Dalmatians. 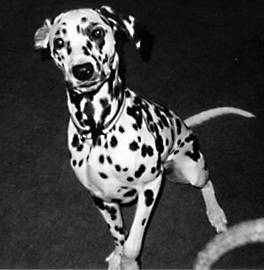 Deaf dog: J.B., a congenitally deaf Dalmatian, is two years old. Human companions: Melanie Brill-Golden, Larry, and Jakob. Other pet: Bailey, a Jack Russell Terrier. Deaf dog: Zoe is a 7 month old Dalmatian. Zoe is the definition of alpha. Even if she could hear I doubt shewould listen. Zoe is also very intelligent and happy. I have never known such a happy soul. In addition, affectionate. Zoe is always at my side or trying to crawl under Cali's, hearing Golden, skin, the closer the better. I cannot imagine life without this little love bug. Other pets: 8 year old golden retriever and three cats. Deaf dog: My name is Bandit and I am a deaf, white Boxer/Pit Bull mix. My birthday is September 3, 2000. My four legged mom is an APT and her name is Sadie. My dad is a white Boxer. I and my sister, Xena were born deaf. Xena and my other brothers and sisters went to forever homes but it took our human mom, Charmaine, a long time to find people who would love us and keep us forever. Mom had my brothers and sisters fixed cause she said there are alot of deaf babies out there that need good homes too and she didnt want us to have any more deaf babies, even though she said I am very very special. I understand my mom cause she uses hand signals to talk to me. She said the only difference between a deaf kid and a hearing kid is that we deaf kids don't communicate with humans through verbal commands. Mom still talks to me too, though. hee hee. So far, I know my name, look at me (my mom), good, come, sit, potty, down and I am learning to sit and stay. That is really hard to do when mom has those delicious treats in her hand and expects me to stay sitting till she picks it up and gives it to me. Mom never had a deaf dog before and cannot believe how easy it is for humans to get trained to talk to us. Deaf dog: Frisby is a mix who came from the Chester County SPCA (he looks like a White Shepherd). He is very friendly and hopefully will be happy in our home. Human companions: Jill and her husband, Chuck. Other pets: Caitlyn - 8 year old Springer Spaniel. Two cats, Rascal and Little Black. Deaf dog: Morgan is a 2 year old black and white Border Collie who was purchased from CA. in an attempt to get a puppy from a reputable breeder. She was CERFed and came from excellent hips. However, I never thought to check her hearing. She was purchased for Agility, obedience and breeding. I really tried to do my homework to avoid any physical problems. It just goes to show that are no givens. She was instructed in obedience and agility since she was 10 weeks old. Around 6 months I began joking about her being deaf. By 1 year I was pretty convinced although no one else believed it. My first trainer was very ignorant and kept arguing with me. She made rude comments to me when I tried to adjust the instruction to meet the needs of my dog. She kept telling me the dog wasn't deaf and inferred that it was my training. I finally left after she had me in tears one day. She received her CGC at 14 months. She has learned all Novice skills and some of the Open ones. She competed in FEO novice only. This was prior to knowing for sure that she was deaf. After the BAER test, it was confirmed. She had a bilateral S/N hearing loss. Flatlined. My degree is in Education of the Hearing Impaired.I have been using obediance signals since day 1 but I added ASL signs over the past 6 months. So it will be interesting to see what we can do. It is amazing how much she knows already. There is great potential for deaf dogs. Deaf dog: Romona is a 3 year old Dalmatian/Terrier mix. She lives with her sister, a minature dachsund, and has grown into a wonderful dog. She loves people and other animals, and with the help of obediance training she has learned how to be a polite and well-behaved member of society. "Romona is a very active, very normal dog other than the fact that she's deaf. She loves to meet new people, and dogs, and she is great with children. I've had her since she was 6 weeks old, and living with her really isn't that much different than living with a hearing dog. I couldn't ask for a more loving dog. She is soon going for her CGC with high hopes of becoming a therapy dog, working with deaf children. " Other pets: A Beagle, Izzy. Deaf dog: We purchased Dixie as a young puppy and it became apparent soon thereafter that she couldn't hear any normal sounds. My first indication was while I was vacuuming one day, I turned the sweeper on next to her and she never awakened from her nap! She does hear very loud, low pitched sounds. We've trained her with some of our hand signals and she has done quite well. Her "herding" dog instincts have made it impossible for us to allow her to remain unleashed on our property. Any person or bicycle that passes by our home is fair game (in her eyes) to chase and try and herd (nipping at their heels). Since we can't call her back when she starts to run at someone, we need to keep her tied when she's outside. It's safer for everyone involved. She a very smart dog, however, and very loyal to our family. Our home is "her" home and she lets anyone who comes on our property know that she's on guard.